Anyone for that matter would admire L…I…M…E as the fruit of Lasting Impression with Motherly Embrace. Undoubtedly Lime is such an adorable kitchen staple for more than thousands of years and its essential oil seldom falls short to heal our mind and body with its numinous aroma. It can be named as an effective anti-blue fruit and oil for its ability to pacify your mood at times of depression and all kinds of blues including postpartum blues. Botanically named as Citrus aurantifolia, Lime is a limb of the citrus family Rutaceae. Ayurveda uses Lime and its essential oil as a stimulant for treating skin problems, heart diseases, digestive disorders and mental mayhems. It has been used to boost brain power, purify the blood and aid in preventing memory loss. Certain other traditional medicines uses Lime as a remedy for treating gout, malignant tumors, throat infections and chronic skin diseases. Lime has been a vital part of the folklore medicine for cleansing the system and revitalizing the mind. Aura is the life force or vital energy of any living thing and is called by different names in various healing systems. It is known as ‘prana’ in Ayurveda and ‘qi’ in Traditional Chinese Medicine. Lime is a powerful ancient remedy for cleansing the aura and restoring confidence. Lime juice is widely known as a remedy for treating scurvy and it has been said that the ancient British sailors used it to prevent scurvy and other skin problems due to its rich Vitamin C content. Ships used for transporting Lime were adorably called as ‘lime juicers’. The leaves of the Lime tree were used in the prehistoric period for treating poisonous bites and swellings. Apart from its medicinal uses Lime has been used in making pickles, sauces, desserts, jams, confectionaries, sorbets, marmalades, beverages, squashes, perfumes, household cleaners, detergents, soaps, cosmetics and other beauty products. According to the Gas chromatography report, Lime oil constitutes of 13 chemical components that contribute to its fragrance, therapeutic attributes, consistency and quality of this oil. Of which, Limonene contributes to the highest proportion of Lime oil constituents with about 65.4% of its total composition. I believe that this must certainly help you in getting to know the exclusive information about these prime chemical constituents of Lime oil. 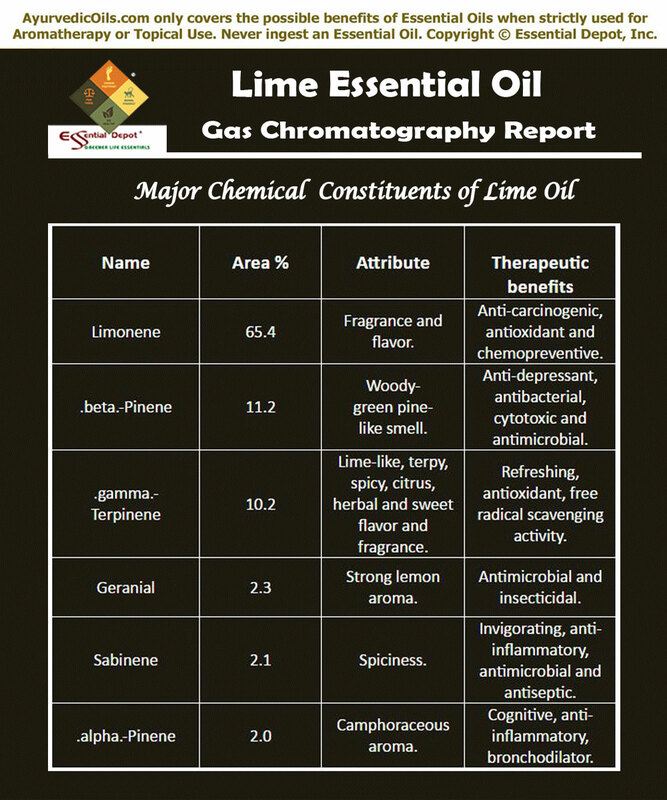 The table crafted below clearly depicts the unique nature and contributions of these biochemical constituents to the healing magnificence of Lime essential oil. These components contribute to its remedial values like astringent, tonic, haemostatic, disinfectant, antiseptic, antimicrobial, antiviral, aperitif, restorative, stimulant and bactericidal. Nature is the best teacher and shows its love to everyone on Earth with maternal care and affection. That is why we call nature as ‘Mother Nature’. Ayurveda is a traditional medicinal system that trusts upon Nature for its healing methodologies. This ancient philosophy states that every human being is a part of nature and his/her health condition completely depends upon one’s balance with nature. Man/woman is made up of the same 5 vital elements of nature namely water, earth, ether, air and fire. These elements combine together in making up the individual constitution of a human being. By this way every individual has a unique constitution identified with the combination of 3 vital bio-energies called as doshas. They are vata dosha that is made up of air and ether, pitta dosha that comprises of fire and water and kapha dosha that is a grouping of water and earth. Ayurvedic treatments differ from individual to individual even for the same health disorder. This is because every individual has a predominance of any one of the three doshas that determines their state of health, personality and behavior and balance between these doshas indicates hale and heartiness. Ayurvedic texts prescribe natural remedies like essential oils, herbs, Ayurvedic routine, yoga, physical exercises and meditation for treating dosha imbalances, healing illnesses, preventing it in future and for healthy aging. Lime is known for alleviating all the three doshas vata, pitta and kapha. Lime is one among the best essential oils for treating dull, oily, lifeless, rough, frizzy and greasy hair. This oil has a handful of essential nutrients that nourish the scalp and add natural shine to your hair. Oily and greasy hair are the most prominent reasons for inviting dandruff as these types of hair attract dust and dirt very easily. LIme removes oil quickly and moisturizes the scalp from within, helping you to get rid of dandruff, dry and itchy scalp. 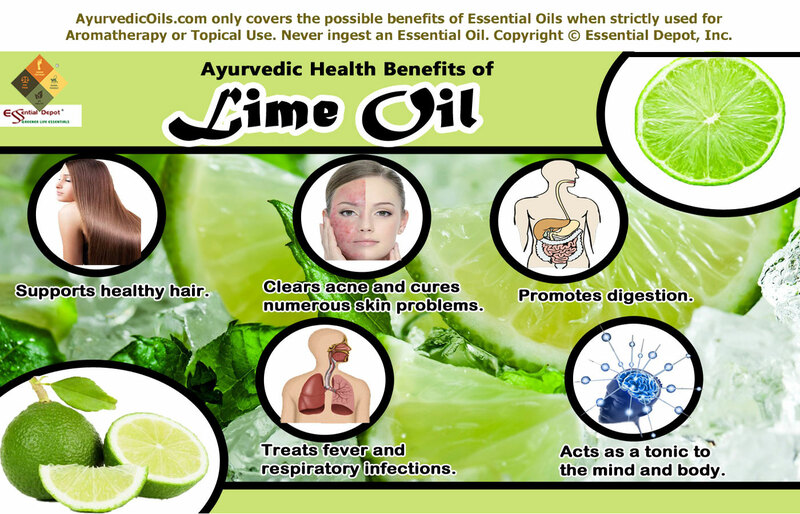 Indian healthcare practitioners consider Lime oil as a traditional hair conditioner. Add 2 drops of Lime essential oil along with your shampoo or conditioner before applying on hair. This aromatic bath assists in cleansing the hair, removing excessive oil, reducing dandruff and making the hair manageable. You can also add 3 drops of Lime oil with 30 drops of sesame oil and heat it in medium flame. Gently massage this warm oil blend on to your scalp and part lines. This massage aids in enriching the scalp by helping it absorb this oil and nourish your hair from the roots. It also increases blood circulation and promotes the growth of healthy hair. Acne is a burning skin problem among teenagers all over the world and it is said that about 85% of the global populace are affected by acne at some point of their life. It occurs mainly due to the excess secretion of oil by the sebaceous glands rooted deeply in the skin surface. This excess oil blocks the glands and cause bacterial growth and inflammation leading to boils, pimples, whiteheads, blackheads and pustules that are collectively known as acne. Mayo clinic recommends the use of products that can control excess oil and treat inflammation. Lime and its essential oil is the best natural cure for clearing acne and the marks left over by acne as it has rich vitamin C and flavonoids acting as antioxidants, which detoxify and cleanse the skin. Applying 2 drops of Lime oil blended with 15 drops of jojoba oil can assist in washing out impurities from the skin and influence the growth of new skin cells. Lime essential oil has antiseptic, bactericidal, disinfectant and astringent properties that fights against harmful bacteria causing skin infections, heals cuts, wounds, boils, cellulites, varicose veins, acne and other skin eruptions. A 2006 study on ‘In vitro antibacterial activity of some plant essential oils’ published in PubMed evaluated the antibacterial activity of about 21 essential oils against 6 bacterial species including 2 gram-positive bacteria Staphylococcus aureus an Bacillus subtilis and 4 gram-negative bacteria Proteus vulgaris, Klebsiella pneumoniae, Escherichia coli and Pseudomonas aeruginosa. Blending 2 to 3 drops of Lime oil with 20 drops of Olive oil and massaging it on the affected areas can assist in treating eczema, cuts, psoriasis, carbuncles, sores, skin ulcers, rashes and gangrene. Founder of the Polarity therapy, Mr. Randolph Stone states that Lime oil blended with Olive oil is an excellent remedy for treating eczema. Dr. Lakshmi Senaratne, senior Ayurvedic scientist at Bandaranaike Memorial Ayurveda Research Institute says that Lime and its essential oil have stomachic properties, thus it naturally promotes the secretion of bile and other gastric juices. This helps in supporting the regular digestion process and enhances your appetite. Being a good laxative, this oil is also effective in treating nausea, dyspepsia and flatulence. The anthelmintic properties of Lime essential oil treat diarrhea, vomiting, indigestion, exhaustion and abdominal pain. It also aids in controlling thirst. She also says that the ability of Lime to lessen pitta and vata energies makes it a powerful remedy for treating vomiting, anorexia, thirst and bleeding disorders. All you need to do to improve your digestive process is to add 2 drops of Lime oil in 20 drops of sesame oil and gently massage on your abdomen. You can also use few drops of this oil in warm or cold compress to treat stomach pain and other discomforts. 3 to 4 drops of Lime oil added to warm bath is also effective in easing the process of digestion. Inhaling the refreshing citrus aroma by adding 2 drops to your burner or diffuser can help control nausea, morning sickness and improve your appetite. Lime essential oil has febrifuge properties that assist in controlling your body temperature by reducing pitta dosha responsible for the temperature level of your body. Massaging your body or your foot soles with 3 drops of Lime oil blended with 20 to 25 drops of coconut oil or 3 drops added to cold compress can reduce your fever gradually by detoxifying your system and eliminating the harmful toxins and fever causing infections through sweat. The antiviral, antibacterial, antimicrobial, immune stimulant and tonic properties of Lime oil aid in fighting against microbes causing cold and fever, strengthening the immune power, combating the growth of detrimental micro-organisms and making the body resistant against infections. 2 drops of Lime essential oil added to steam inhalation can help in treating cold, flu, sinusitis, bronchitis, cough, sore throat, asthma and other similar respiratory infections. You can also mix 3 drops of Lime oil with 20 to 25 drops of coconut oil and apply it on your chest, neck and back for good relief. It helps loosen the phlegm deposits causing congestion in the bronchial passages. You can also add 1 drop of Lime oil to a cup of warm water and use it as a gargle for treating sore throat and for freshening your breath. Lime has a divine aroma that is refreshing, rejuvenating, revitalizing, strengthening, uplifting and calming in nature. It helps in purifying the aura and strengthening the heart chakra responsible for love for others and self. Adding 2 drops of Lime oil to your vaporizer, diffuser, burner or aromatic lamps can help in improving your concentration power and your immunity. This is mainly because of the tonic and restorative properties of Lime oil that helps you regain the lost energy of the mind and body due to diseases or emotional breakups. Adding 3 to 4 drops of Lime essential oil in your bath tub can assist in relieving stress, depression, irritation, anxiety, muscular pain, tension, lack of self-confidence and negative feelings. Lime oil fortifies the mind and body by drawing the energies inward and helps an individual to focus without any distractions. Never use essential oils internally. Do not go out in the sun immediately after using Lime essential oil on your skin as all citrus oils has phototoxic effect and can cause irritation when exposed to the harmful UV rays. Always remember to dilute essential oils before using them topically. Consult your Ayurvedic practitioner before using the suitable essential oils for your individual constitution and state of health. This article is only for educational purpose and is not intended to replace any professional advice or prescribed medication. The MSDS (Material Safety Data Sheet) of Lime oil is readily available for your enhanced safety and better usage. 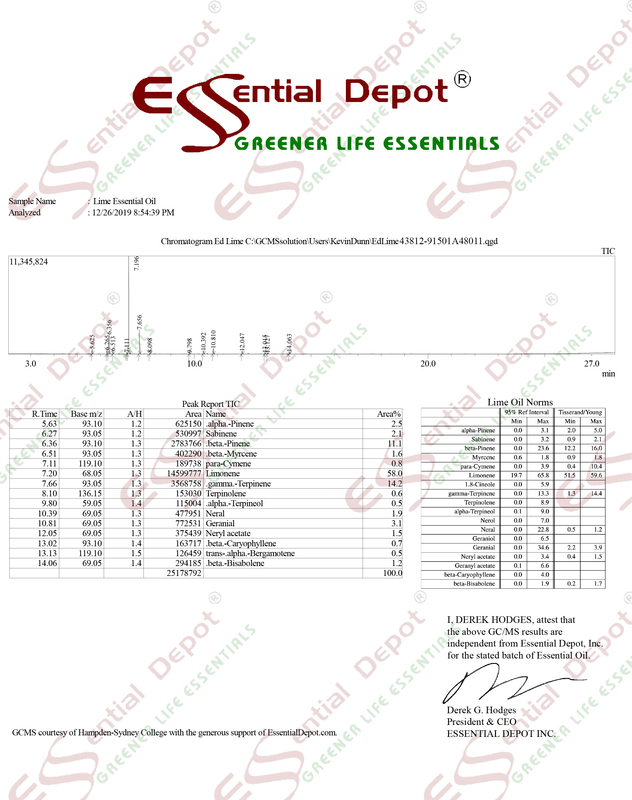 Gas Chromatography Report (GC analysis) of Lime oil. Lime essential oil has photosensitizing effect that can end up in causing irritation of the skin, allergic reactions, burning sensation, phytophotodermatitis, hyperpigmentation (change of skin color, visible especially in people with white skin complexion) and certain other effects. This is said to happen mainly because of Lime oil’s potent to stimulate the skin photosensitivity, when it is exposed to observable sunlight up to 12 hours of use. The underlying cause is the response of the photoactive chemical constituents that attracts UV light radiation and contributes to toxicity through molecular alterations in the surface of the skin. Few other studies also witness the effects of photosensitization of Lime and Lime-based products containing psoralens, paving way for burns, blisters, bullae, eruption, erythematous vesicles, rashes, inflammation and hyperpigmentation. It is also been said that in certain severe cases, systemic toxicity come with the rashes, which includes nausea, vomiting and fever. The safe dilution level of Lime oil is 0.7%, which is 4.2 drops per ounce of any carrier oils as per the International Fragrance Association (IFRA). This safe dilution level applies only for products used topically to thwart photosensitivity and is not applicable for wash-away products like soaps, shampoos and other bathing products. Lime oil has ‘Generally Recognized As Safe (GRAS)’status by FDA (U.S. Food and Drug Administration). As per the European regulatory body, essential oils with furanocoumarins must be used in such a way that the level of bergapten should not go beyond 15ppm (parts per million) in ready to use cosmetic products after which the skin is subjected to exposure of direct sunlight and this does not apply for wash-off products. The level of bergapten should be1 ppm in bronzing and sun protection products. For your information, Furocoumarins are also used in healing practices on par with the long-wave ultraviolet light therapy for treating vitiligo, psoriasis and mycosis fungoides. 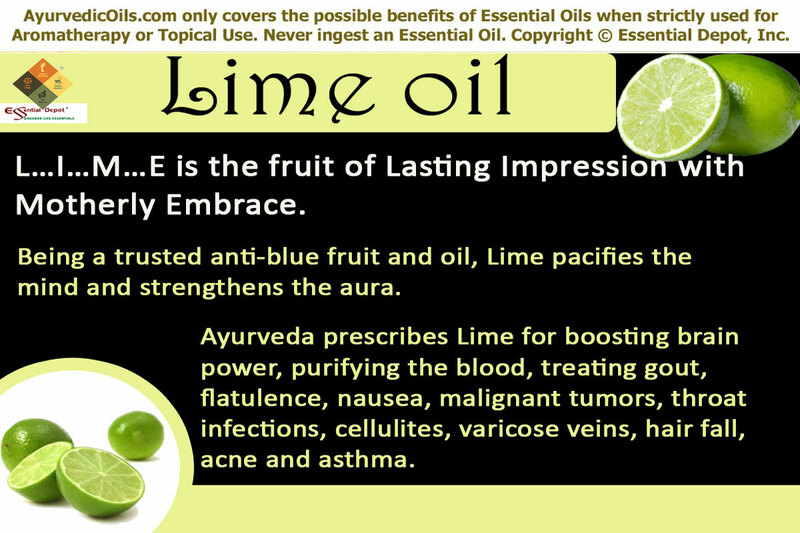 This entry was posted in Essential Oils - Learn About and Purchase and tagged Adverse effects of Lime oil, Ayurvedic health benefits of Lime essential oil, Ayurvedic oils for acne, Ayurvedic oils for bronchitis, Ayurvedic oils for depression, Ayurvedic oils for hair care, Ayurvedic oils for indigestion, Ayurvedic oils for sinusitis, Ayurvedic oils for varicose veins, Ayurvedic remedies for cold, Ayurvedic remedies for concentration power, Ayurvedic remedies for dandruff, Ayurvedic remedies for fever, Ayurvedic remedies for flatulence, Ayurvedic remedies for skin care, Chemical constituents of Lime Oil, Gas Chromatography report of Lime oil, Greener life Diamond Bio-Healthy Score of Lime oil, Health benefits of Lime essential oil, MSDS report of Lime oil, Natural remedies for respiratory infections, Possible skin issues of Lime oil, Safety data sheet of Lime oil, Therapeutic properties of Lime Oil by AyurvedicOils. Bookmark the permalink.